3) Is human activity powerful enough to explain global warming? 3) Is human activity powerful enough to explain global warming? Between 1975 and 2005, an increase in temperature at the surface level of the earth of at least 0.5 [K] was recorded. Has human activity alone had enough power to generate the heat necessary to warm up the billions of tons of rocks, water and air? 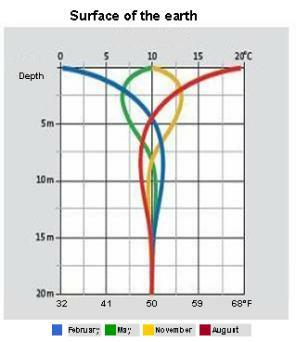 The first figure shows seasonal variation of surface temperatures, which are sensitive mostly down to 15 meters of depth (source: Dimplex). The second figure (on the left) shows the decrease in temperature fluctuations of the atmosphere with depth and time delay of transmission. In A, the change of temperature nearby a permafrost (underground layer permanently frozen). In B and C, the change in temperature in a thawed soil nearby a permafrost, which shows the temperature rise on the first tens of meters of depth. For the oceans, the situation fluctuates more, but stratification plays a role as well. As a first approach, we will carry out a crude estimation by assuming that the increase of 0.5 [K] nearby the ground surface is reflected on all the atmosphere and only half of it is reflected on the first 15 meters of rocks and water below the surface. In addition, we will not account for the increase in thermal losses towards space, which is suspected to be affected by the increase green house effect. Compute in Joule the quantity of heat corresponding to a homogeneous increase of 0.5 [K] on the entire atmosphere and of 0.25 [K] on the first 15 meters of rocks and water below the surface. Without accounting for the concomitant increase of energy losses towards space, compute the thermal power that corresponds to this warm up recorded over the last 30 years. P = 1.33 x E13 [W], which we can compare to the current worldwide power of energy of 1.5 x E13 [W] in 2008. Note: accounting for the increase in the quantity of water vapor stocked in the atmosphere during the period modifies the result only very slightly. Evidently, this computation is too crude to be perfectly correct. It shows however that such a “low” power, such as the one we emit, can explain under specific conditions the current warming “at the surface” of the earth. But we still need to shed light on a large ambiguity, that is: at the beginning of the last century the planet was subject to an increase in absorbed solar power tens of times superior to the one generated by human activity in 2008 and the resulting increase in temperature was not any greater than a few thenths of degrees.